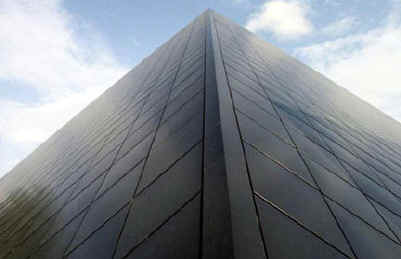 The Great Pyramid of Giza Research Association (gizapyramid.com) is not only interested in research and discoveries on the Great Pyramid of Giza, but also pyramid research in general. Many of our board members and research associates have for many years been studying the effects of pyramid shapes in the laboratory and in large structures built in the pyramid shape. Back in the 1960's, a Czech inventor first publicized the ability of small pyramid models to sharpen razor blades and preserve food. 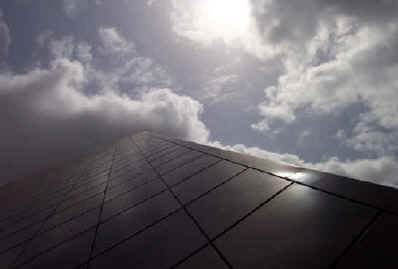 This set off an interest in the effect of pyramids, at that time called "Pyramid Power". One of our board members, Patrick Flanagan, M.D., Ph.D., (gizapyramid.com/BIO-Flanagan.htm) was the first person to publish a book in the 1970's on pyramid power (Pyramid Power). Since than many researchers have continued to explore this area and to note changes that the pyramid shape produces in different objects. Many of our board members have been involved in this type of research. Another board member, Kirti Betai, B.Comm.LLB. 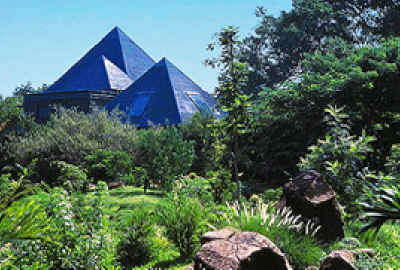 (gizapyramid.com/BIO-Betai.htm) from India has used pyramid structures to treat over 30,000 patients in the last 10 years. Two other board members, Joe Parr (gizapyramid.com/BIO-Parr.htm), an electronics engineer and Dan Davidson (gizapyramid.com/BIO-Davidson.htm), a physicist have been experimenting with pyramid shapes in their labs for over 20 years. They have shown that the pyramid produces an energy field and can block out known electromagnetic radiation and other forms of energy. Also, the pyramid shape can cause changes in brain function. The largest research project in the world today was done by Russian and Ukrainian researchers. This research was done in more than 20 large pyramids that were built in 8 different locations in Russia and the Ukraine in the last 10 years. Many different experiments were done using these pyramids that include studies in medicine, ecology, agriculture, physics, and other areas. I have started a partnership with the builders of these pyramids, Alexander and Anatoli Golod to continue to do research on the Russian Pyramids (gizapyramid.com/russian/pyramids.htm). Board Member Edward Gorouvein (gizapyramid.com/BIO-Gorouvein.htm) from Canada as been developing and manufacturing pyramids based on Golod's design. His research shows that using these pyramids and other products which he has developed can cause significant medical and psychological improvements. Another board member from the Ukraine, Volodymyr Krasnoholovets, Ph.D.(gizapyramid.com/BIO-DrK.htm) has claimed to be able to identify and measure this pyramid field. I have just mentioned a few of our researchers and their involvement with pyramid research. The common thread is that all these researchers have shown that the pyramid shape has an effect on humans, both physically and mentally. It is also known that people have claimed to have beneficial effects by meditating under and near pyramid shapes. Also, some have claimed that pyramids can produce altered states of consciousness and out of the body experiences. These claims need to be verified scientifically, but it appears that this is almost a universal phenomena and maybe the ancients were aware of this effect. Our association has been trying to be aware of any new pyramid building projects or research going on in the world today. 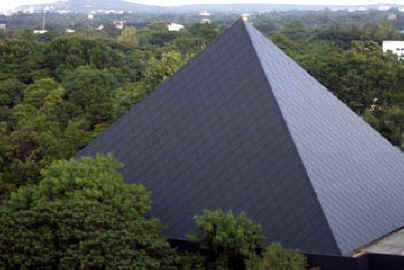 I was recently informed that a very large pyramid shaped building was just opened on November 1, 2002 in Pune, India. This building was constructed specifically for meditation purposes. It can hold over 5000 people and it was designed by an Indian mystic and spiritual teacher, known as Osho (osho.com) just before he died. 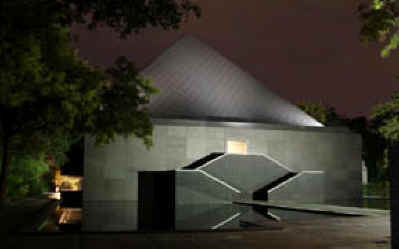 He wanted this building constructed especially to be used for meditation purposes. It is very interesting that many spiritual teachers and mystics from India have always acknowledged the power of the pyramid shape for meditation. 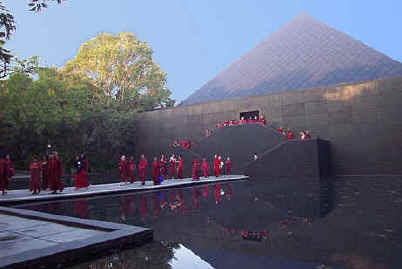 This the largest complex in the world today constructed specifically for meditation. Below are some photos of this complex that were sent to me by Osho International and are used here with permission.